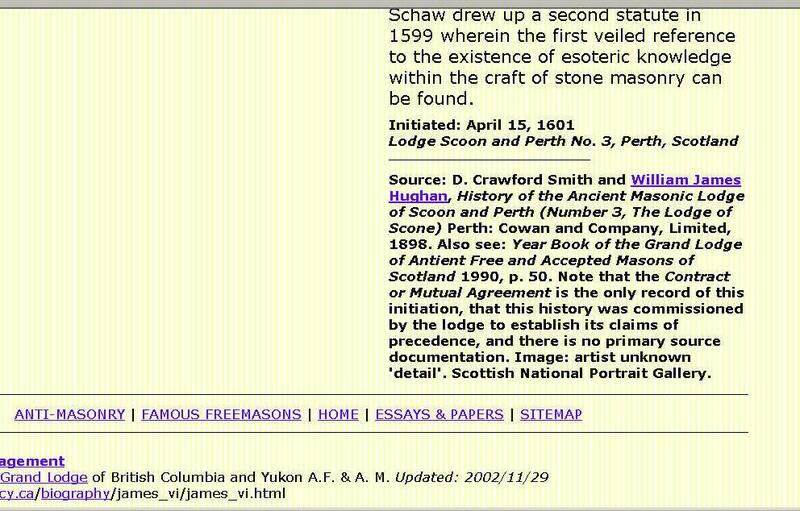 Note that the citation for the History of the Ancient Masonic Lodge of Scoon and Perth states that “the Contract or Mutual Agreement is the only record of this initiation” and admits that “there is no primary source documentation” of this initiation. The aforementioned You Tube video does not scroll down the page so that viewers see the disclaimer. 1. of doubtful authorship or authenticity. The disclaimer was written by Edward Macbean who was an officer of the Quatuor Coronati Lodge, the premier lodge for Masonic research. The Quatuor Coronati Lodge is located in Freemason Hall, the venue of the United Grand Lodge of England, on 60 Great Queen Street, London. 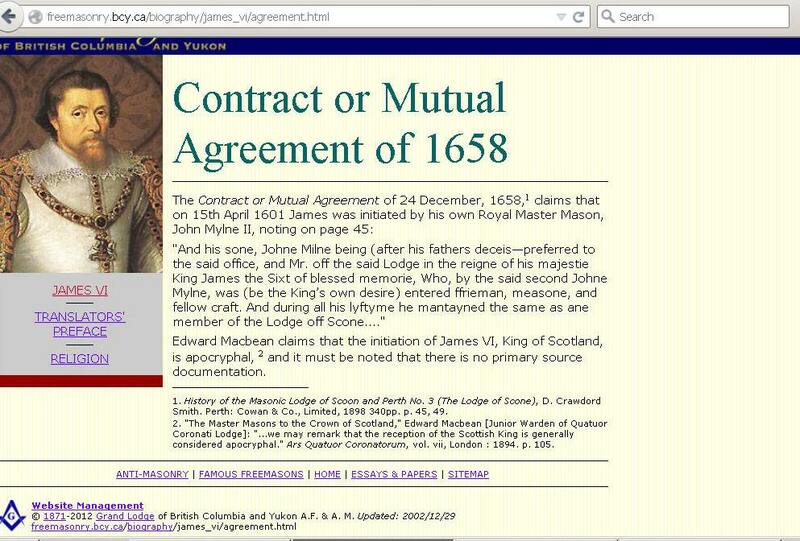 In other words, “imaginative writings” such as the “Contract” or “Mutual Agreement” which was invented by Scottish Rite Masons to slander King James VI without a shred of source documentation, such as a Masonic certificate of initiation signed by King James. 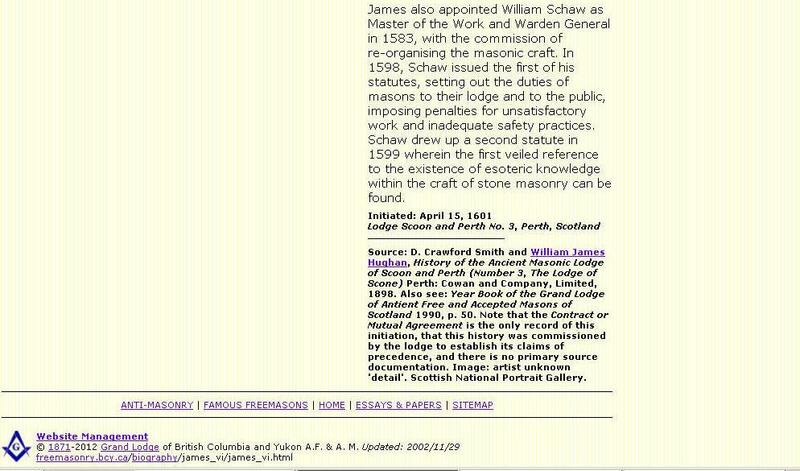 The Quatuor Coronati Lodge regrets that “evidence-based” study is still sacrificed to the “imaginative writings” of Freemasons today, such as the Grand Lodge of British Columbia and Yukon's fictitious account of King James VI's initiation into Freemasonry. If the King of England and Scotland had been initiated into Freemasonry, the Grand Lodge of England would have a record of it, which they do not. No doubt the United Grand Lodge of England was well aware of King James antipathy toward the occult societies, for he prosecuted witches and Rosicrucians, the precursors of the Masons in his day. 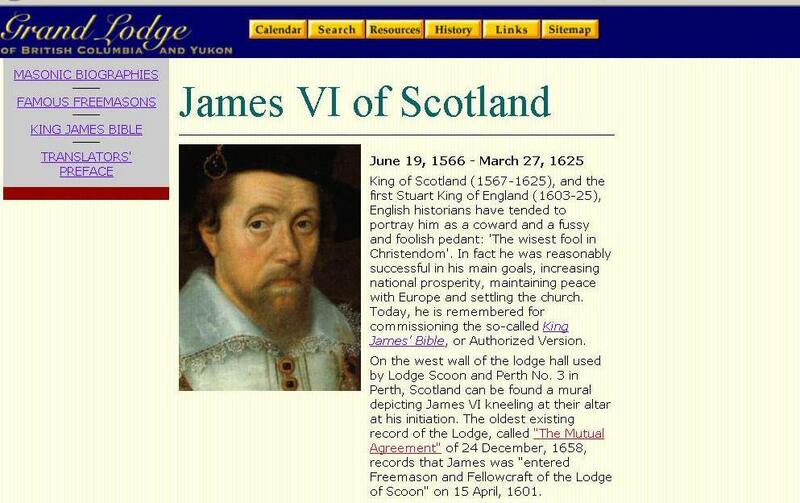 King James’ personal writings also strongly refute the charge that he was a Freemason. A close look at these genealogies reveals that the so-called “Masonic handshakes” always link husbands and their wives. In fact, they are not Masonic handshakes at all but symbols traditionally found on tombstones which denote marital union. 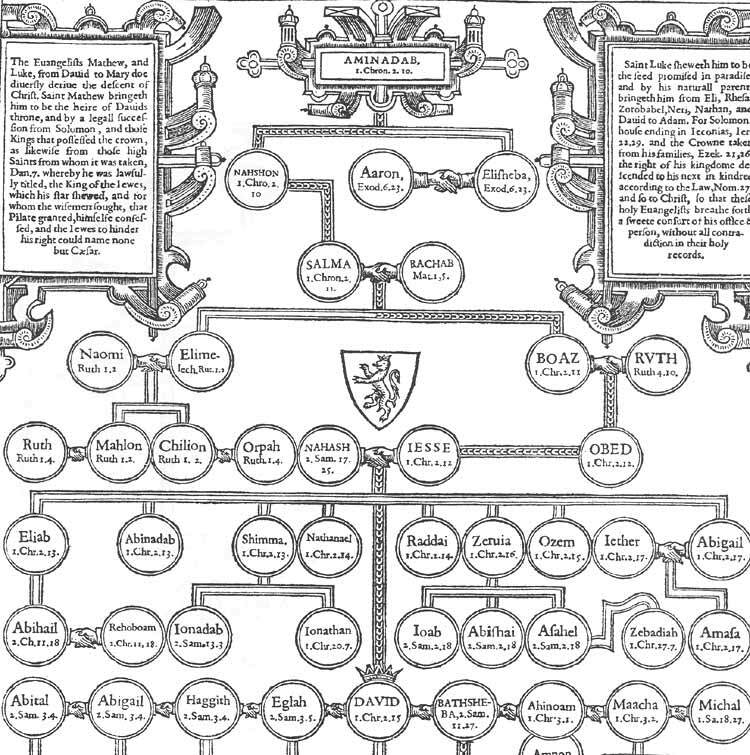 The “clasped hands” in the 1611 genealogies show the marriages of the Biblical Patriarchs. Were they all Masons? Was Adam a Freemason and Eve a member of the Eastern Star? Were Abraham, Sarah and Hagar Masons? Isaac and Rebecca? Jacob and his wives, Leah and Rebecca? Judah and Tamar? Joseph and Asenath? Moses and Zipporah? David, Michal, Abigail, and Bathsheba? 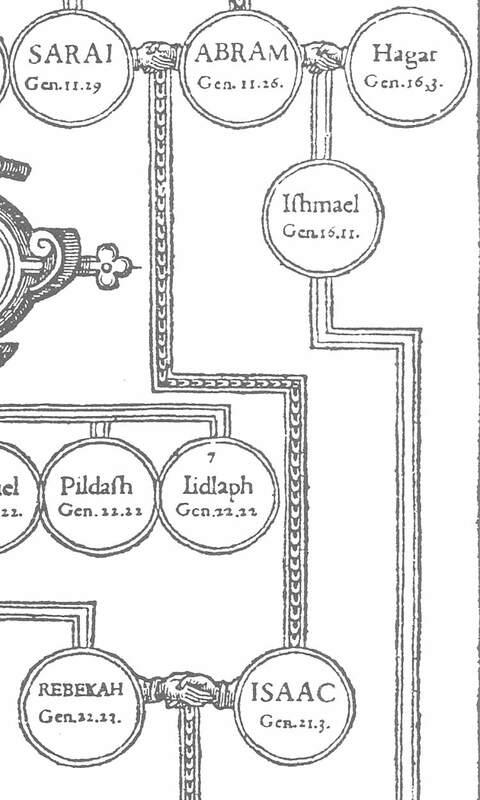 Naomi and Elimelech? Boaz and Ruth? Hosea and Gomer? Perhaps Joseph and Mary were Freemasons... The allegation of “Masonic handshakes” in the 1611 KJV would be laughable if it were not accepted as true by so many Christians. This expose shows how Masonic propagandists conspire to deceive undiscerning Christians. For this reason, it is imperative that Christians not be quick to believe the persuasive words of men but do their own research of primary sources. Here a personal testimony seems germane to my point. In 1994 I read New Age Bible Versions by Gail Riplinger and became aware of the doctrinal revisions in modern translations and a conspiracy to corrupt the Word of God. I also gave a copy to my father for Father’s Day. Upon reading it, he immediately made a trip to the main library and requested The Life and Letters of B.F. Westcott and The Life and Letters of F.H.A. Hort through interlibrary loan. He wanted to verify the documentation in the endnotes of New Age Bible Versions that B.F. Westcott and F.H.A. Hort were occultists with an agenda to corrupt the English Bible. After he confirmed that the citations from these sources in New Age Bible Versions were accurate, he proceeded to compare verses in his NIV with those in the KJV. Then he started a table of comparison of verses according to fundamental doctrines and added the English Revised Version, New American Standard Version and the New King James Version. From this experience I learned to verify everything I read and not to trust the words and works of men. Ronald Reagan said, “Trust, but verify,” however, I have learned to only trust the Lord to always speak the truth. Whatever man says must be verified in primary source documents, which is the reason for the multitude of references and footnotes on the Watch Unto Prayer website. Because the deception of the last days is so powerful, even leading the elect astray, it is imperative that Christians pray that the Holy Spirit show them the truth about every spiritual matter. Instead of putting confidence in men or, God forbid, You Tube videos, take nothing for granted but examine all things and PRAY that the Holy Spirit will lead you into ALL TRUTH, which He has promised to do.